A bento box is traditionally a plastic or lacquered wood "box" containing small, individual compartments ... which hold a Japanese meal (particularly lunch). 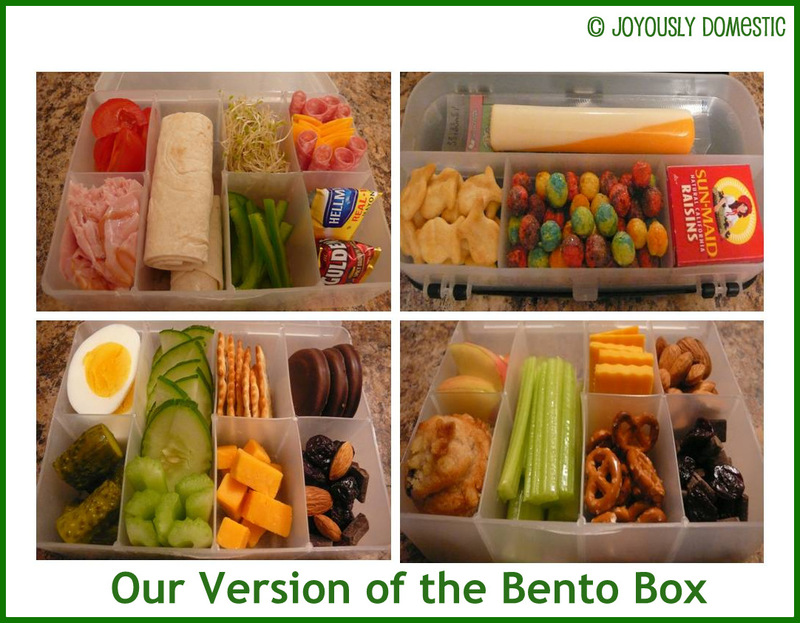 They can get pretty elaborate (just do an image search for "bento boxes"). 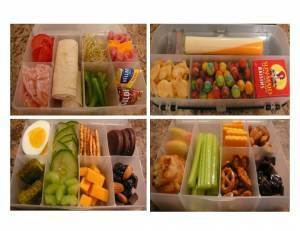 For a couple of years now, I have taken that idea and made our version of bento boxes for my kids to take to school for lunch or for us to take in the van on the go. I have always found that kids prefer a variety of things to choose from when eating ... and they like little bite-size items. My kids love having their own little "box" of goodies and tell me that their friends at the lunch table think it is super cool! Although you can purchase authentic bento boxes in all sorts of sizes, colors and shapes online (and in a few stores like, Target), they are rather pricey. I picked up a couple of small, plastic storage boxes for a couple of bucks in the craft section at Wal-Mart and they work wonderfully (see NOTE at bottom of post). These fit perfectly in my kids' lunch bags, too! Throw in some juice and an ice pack and they're all set! And, for adults or older children, you can send them with some pita or cut a tortilla in a few smaller pieces ... and pack all the components for a wrap. I always save those little mayo, mustard and salad dressing packets from take-out and keep them in the fridge. So, when I do something like this, I can send them with condiments, too. And, for my four-year old, we like to take along something for the van ride when we're out running errands or taking the older kids to practices and activities. So, as silly as this sounds, I bought a couple of pencil boxes with little compartments on both sides. These work perfectly for little portions for her. Where would I find this?? ?